The MUST HAVE in Cashmere Blend Extended Crew Socks...Natori! Each pattern is a wardrobe essential! The House of Natori was founded in 1977 and today is one of the fashion industry's most recognizable designer brands. Each of the Natori brand collections -- Josie Natori, Natori, N Natori and Josie by Natori -- is a reflection of the namesake designer's distinctive, East/West aesthetic, with products ranging from ready-to-wear, lingerie, and sleepwear, to home textiles and accessories, bath, and fragrance. Natori Extended Crew Rumi Swirl Cashmere Blend Antique Socks (more info) — only 3 left! Natori Extended Crew Rumi Swirl Cashmere Blend Dk Gray Heather Socks (more info) — SOLD OUT! Natori Tight Knit Honey Comb Extended Crew Cashmere Blend Socks - SNCE-002 Antique (more info) — only 4 left! 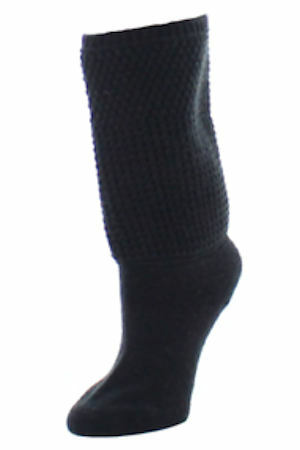 Natori Tight Knit Honey Comb Extended Crew Cashmere Blend Socks - SNCE-002 Black (more info) — only 5 left! 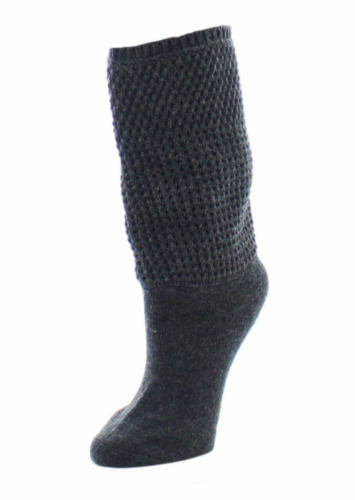 Natori Tight Knit Honey Comb Extended Crew Cashmere Blend Socks - SNCE-002 Dark Gray Heather (more info) — only 6 left! Natori Tight Knit Honey Comb Extended Crew Cashmere Blend Socks - SNCE-002 Md Gray Heather (more info) — only 9 left!